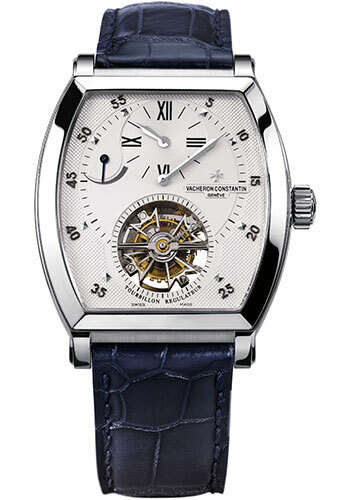 39.9mm x 49.9mm platinum case, transpararent sapphire crystal back, 18K white gold Clous de Paris pattern dial, manual-winding tourbillon 1790 R movement with hours, minutes, regulator, tourbillon, small seconds on tourbillon cage, and power reserve, approximately 40 hours of power reserve, dark blue alligator strap with platinum folding buckle. Water resistant to 30 meters. 39.9mm x 49.9mm 18K 5N pink gold case, transpararent sapphire crystal back, 18K white gold Clous de Paris pattern dial, manual-winding tourbillon 1790 R movement with hours, minutes, regulator, tourbillon, small seconds on tourbillon cage, and power reserve, approximately 40 hours of power reserve, brown alligator strap with 18K pink gold folding buckle. Water resistant to 30 meters.